The Bradford pear tree, while being a predictable old standby in the landscape plan, is not necessarily a standout specimen to use. But since it is such a recognizable flowering ornamental tree, let’s take a little time to get familiar with this species, its cultural needs, characteristics, and growth habit. The Bradford pear (Pyrus calleryana ‘Bradford’) is a pyramidal to oval-shaped tree with tightly held branches and a densely profuse leafing habit. This shape, combined with its abundance of beautiful white blossoms in the springtime and glossy dark green leaves throughout the summer, gives this tree a somewhat formal-looking appearance as it takes its place in the landscape. On the positive side, let’s note that Bradford pear is quite undemanding in its growth needs, thriving in average to poor soil (this can be a real advantage as the tree is often planted in the less-than-fertile soil surrounding new-construction building sites.) Also, the tree is resistant to drought conditions and to fire blight. The tree prefers full sun, but will certainly survive and grow quite well, though more slowly, in part shade. 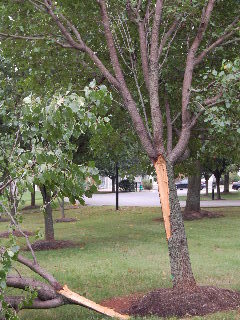 The Bradford pear tree is thornless, and even though some of the trees do produce small inedible fruits, these are not so plentiful or “fruity” as to cause a messy by-product on the ground under the trees, which might attract undesirable insects or require clean-up. Another check mark in the plus column for this tree is the fact that its glossy green leaves turn to a beautiful shade of purple-red in the autumn. So, for a quick review of the positives about Bradford pear: we have a tree that is easy to grow, has pretty white blossoms in the spring, pretty green leaves in the summer, and pretty reddish leaves in the fall. Now for the not-so-good news. While these trees are generally medium sized in height (about 25 to 35 feet), over a period of time they can reach heights up to 50 feet and more. Combine this with the aforementioned tight growth habit, which has the lateral branches hugging the central stem of the tree in such a manner that creates a series of sharply angled “crotches”, and the aging Bradford pear tree is a mass of heavy limbs waiting to splinter and split from the tree during times of ice, wind, or storms. And, (the bad news gets worse) when these limbs do break off, it’s ugly! Large holes are created and the tree is instantly out of balance. What you are left with is not a symmetrical view of pretty blossoms or leaves, but rather an unattractive view of the dark colored bark of the inner limbs of the tree where the outer limb has been ripped away. These large holes will not fill themselves in readily with new growth, so you’re stuck with a large tree that isn’t very pretty. 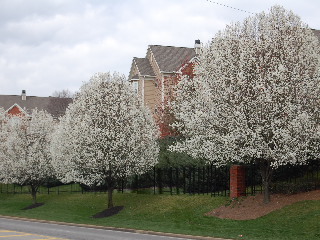 So, if you choose to add trees to your home landscape, think twice (or maybe three times) before adding Bradford pear (and its accompanying potential for "bustin' loose.") Maybe a nice Japanese maple, or a weeping cherry, or a flowering dogwood would be a good choice. The possibilities are many and the long-range rewards from trees that don’t self-destruct are great!